We got a lot of snow this week and the kids love it! It was pretty cold outside but it didn't stop them to have fun and enjoy the snow. We make a little hill in the backyard from the deck down to the ground and its just right for the little one like them to sled and they love it! 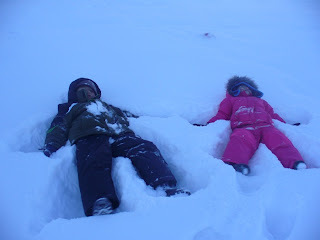 I couldn't get myself to lay down in the snow and make snow angels but the kids can! hehe :-) Love this photo, they are so adorable! Once in a while I scan my computer for viruses. I trust our security software here and so far we didn’t have a problem for virus. Virus is really bad, when you get a virus attack in your computer, you need to re-program it again. It takes a lot of work and if you don’t have back up for your files, I am sure you will lose all of them and need to start all over again. That’s why it is important to have a security software in your computer because we never know that all those website we search and browse have a deadly virus. 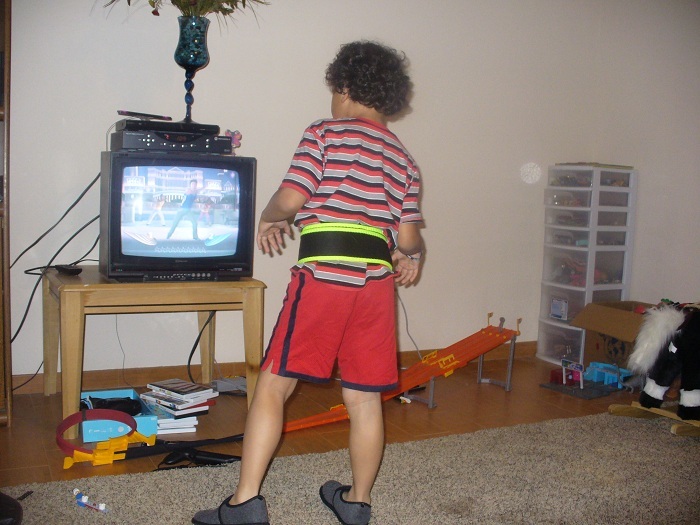 When I got this zumba fitness wii game, I am not the only one who play and dance with it. 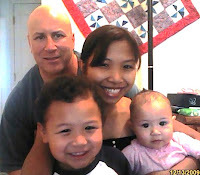 Me, my husband and my two kids is also dance with me and its nice to do it as a family. We try to work out 30 minutes to one hour a day. But the kids and my husband can only last about 15-20 minutes, but its okay at least they tried. 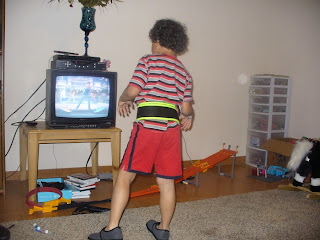 This is a picture of my 6 year old son, having fun on this zumba fitness, he has about 4-5 favorite dance move and it makes him feel good when he earn stars. No one doesn’t like to swim in a cold swimming pool. Do you? I used to swim in a cold pool before when I was in the Philippines but when I came here in the US, I always use hot water for my shower. Hot spring is also popular in this Valley so usually me and my friends go their once or twice a year. It depends on the weather. When we go travel, we expect that the swimming pool at the hotel is warm because if its cold, we won’t go on swimming and the kids doesn’t like it anyway, its way too cold for them, good thing they also have a warm tub so in case you get cold in the pool then you can spend the rest of your time hanging out in a warm tub. Anyhow, I wonder if some of them use the raypak pool heaters from poolsupplyunlimited.com, they have great products when it comes to pool heaters. We will take Dustin to an ear and nose specialist this afternoon to make sure everything is okay. Dustin still have this stuffy nose and it affects his ears. The last time we went to the Doctor, the Doctor said he has a little bit of an ear infection. He didn't give him an antibiotic instead he can use the nasal spray until his nose cleared up. Yesterday, I am kind a worried because when he woke up in the morning, his right side of his neck below his ears is swolen. So I was thinking maybe because he lays down on that side more that's why he got the cramps. When I was checking it, there's a little bump in it, he has swolen glands. So before lunch after I went grocery, I went to their school to check him out and see how his doing but he seems fine. He said, he feel okay and not feel the pain at all so I guess its not that bad. So today, the kids still sleeping and I will wake them up in about an hour and will get ready to go to the doctor for Dustin check up at 11:00am. I'm glad my 3 year old daughter is completely potty trained now. She always told me whenever she wants to go potty. She did pretty good though but sometimes she had one accident in the afternoon especially when she is playing. I let her wear big girl underwear but seems like she doesn't like it. She is not used to it and she likes the training pants better than her big girl underwear. We bought her the one she likes but until now she is not wearing it. She prefer the training pants better. Maybe it takes a while for her to get used to a big girl underwear but I'm still happy that she go potty in the bathroom now by herself. She is a big girl now!